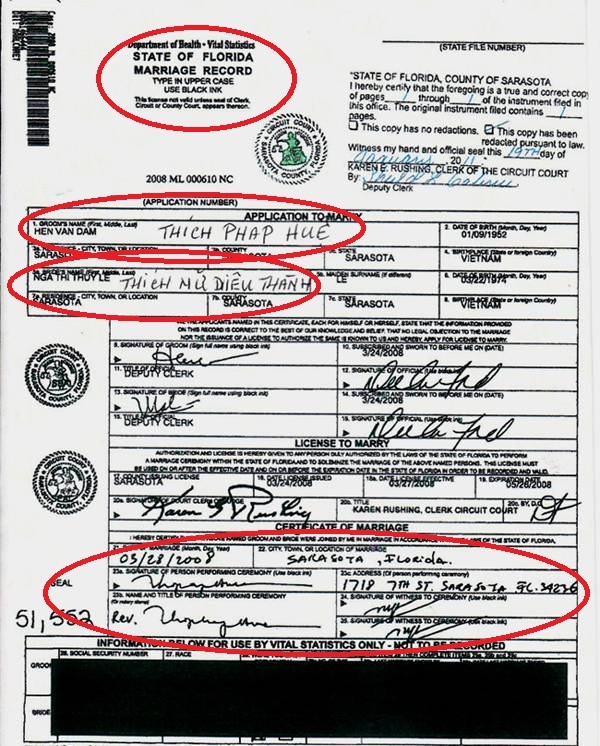 BRADENTON -- Kim Sang Thi Vo kept her financial matters secret in the decades she called Florida home, from the time she fled Vietnam with nine family members during the fall of Saigon. She had served as a translator for the U.S. military, she told a newspaper last April, and was forced to run from the communist regime. Now, in the months since her death last August, after she suddenly fell ill at the Buddhist temple where she lived, Vo's finances have become a matter of public record. Her relatives say in a lawsuit that as they visited with her on her death bed Aug. 9, a nun from the temple was removing $30,000 from Vo's account. 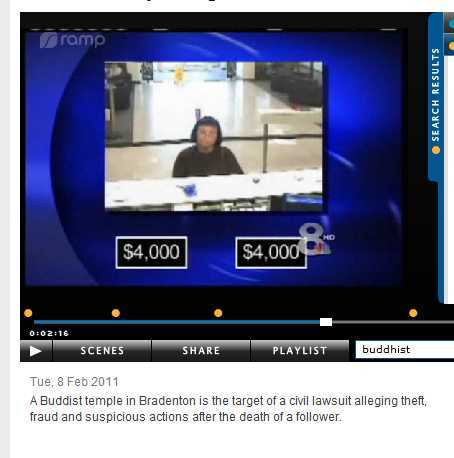 "We haven't even gotten word that she's legally dead and she's at a bank withdrawing money," said Mai Holley, a niece of Vo's who lives in Tampa. The suit also claims temple leaders declined Vo's request to call 911 after she complained of headaches. They gave her Tylenol instead, the suit says, and she died from a hemorrhage at a hospital the next day. Manatee County sheriff's detectives looked into the allegations in the suit and have closed their investigation without filing charges. 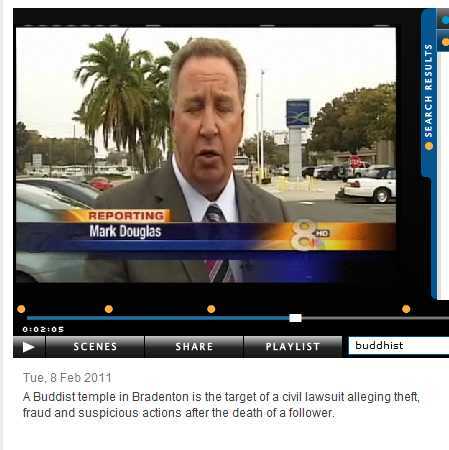 Still, Detective Larry Tyre told a reporter he remains puzzled by two other withdrawals Vo made from her own account. They were for $4,000 each, made within 30 minutes of one another at separate bank branches, three days before Vo's death. The lawsuit says no one at the temple has accounted for any of the withdrawals. "She never wanted to give anybody money," said Vo's sister, Mai Lan Holley. "That's why we all question it." * * * * * A lawyer for the temple rejects the fraud and conspiracy allegations in the lawsuit as nothing more than "a good piece of fiction." "It portrays those close to Kim as murderers and perpetrators of fraud," attorney Katsuaki Suzuki wrote in a statement to News Channel 8. "Yet, my clients were never charged." 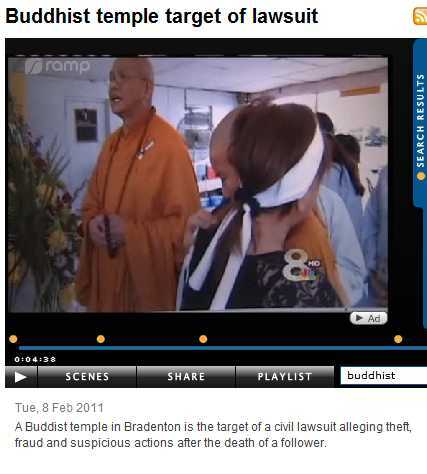 But a News Channel 8 investigation uncovered a temple secret that the family now holds up to support its allegations of fraud: The resident monk and nun - Hen Van Dam, 59, and Nga Thi Thuy Le, 36 - are man and wife. "To me it shows a pattern of fraud, among other things, and wrongdoing," said attorney Francine Martin, who filed the lawsuit on behalf of the family. The marriage contradicts the Buddhist tradition of celibacy among clerics. 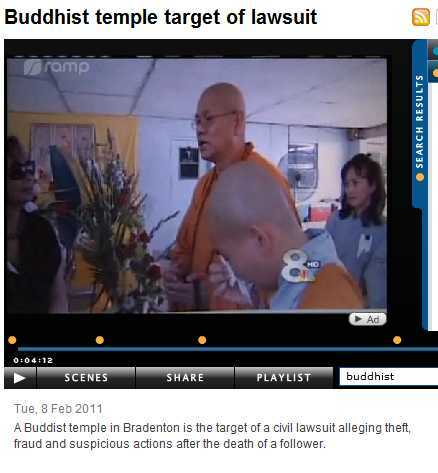 "Not allowed to do that," said The Venerable Thich Tri Tinh, abbot of the Phat Phap temple in St. Petersburg. Tinh's temple operates independent of Dam's but both serve Buddhists of Vietnamese background. 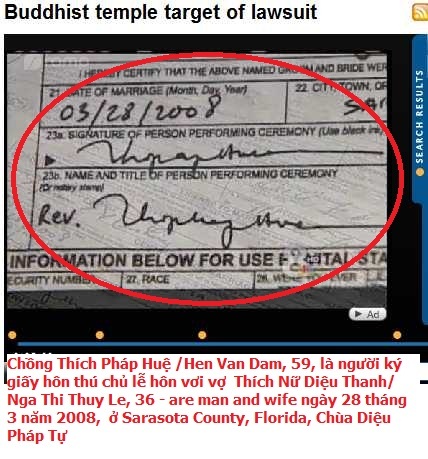 What's more, the Sarasota County marriage certificate shows the groom performed the wedding, using his religious name Thich Phap Hue and the title "Rev." It's a rare but legal practice, said Beth Allman, spokeswoman for the Florida Association of Court Clerks. But it's a practice not likely to sit well with the followers at Dam's temple. "It would create a big problem if that's the case and it comes out," said Kim Tran, one of the few-dozen temple followers. When a reporter approached Dam about his marriage, the monk denied it. "No, I've got to go to work, I'm sorry," he said, when shown the marriage certificate, before rushing into his workplace at a communications company in Sarasota. Attorney Suzuki did not respond to requests to answer questions about the marriage. 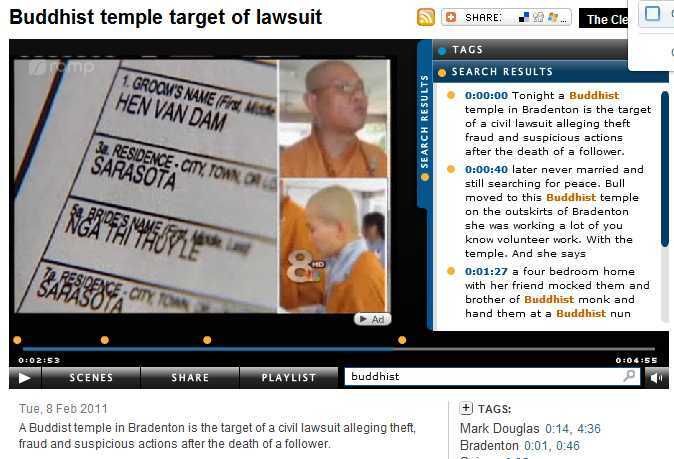 * * * * * The lawsuit filed against the temple, by Vo's sister Hong Rosson, says Hen Van Dam, his sister Mot Thi Dam, and Nga Thi Thuy Le defrauded Vo out of her savings through trickery and deceit. •From the time Vo moved into the temple on May 17 until her sudden illness three months later, she was under constant pressure to donate her personal funds to the temple. •The defendants conspired to add Le's name to Vo's bank account five weeks after Vo moved in and forged Vo's signature on bank records. •At the insistence of Le, Vo demanded repayment of a 12-year-old-loan from the ex-husband of her sister, Rosson. Ten days before Vo's death, Jeffrey Kent Rosson transferred $40,000 into the joint account Vo held with Le. •Vo began making arrangements to move out of the temple in the days before her death because she was having trouble sleeping there and wanted to leave. In his report, Detective Tyre concluded the $30,000 withdrawn by Le on the day of Vo's death was legal because the nun "was voluntarily added to the Vo account." Manatee sheriff's Sgt. Peter Rampone told a reporter he found no evidence of foul play in Vo's death. * * * * * Vo's path to the Buddhist compound began in the final hours of the Vietnam War. Last year, on the 35th anniversary of Saigon's fall, a month before she moved to the temple, Vo described the ordeal to Florida Today in Brevard County. She lived in Brevard County for 17 years with her married sister, Rosson, and Mot Thi Dam. 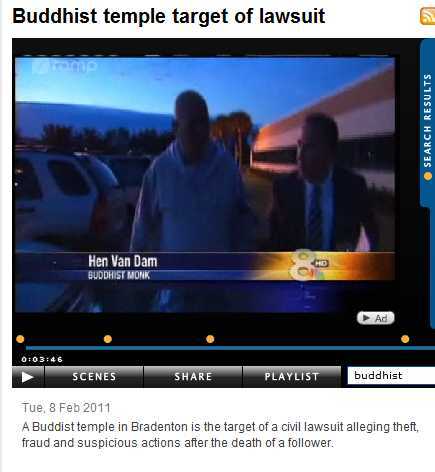 When Rosson's marriage broke up, Vo and Mot Dam moved to Bradenton, where Mot Dam's brother, Hen Van Dam, serves as the monk for the Dieu Phap Buddhist Association. Mai Holley, Vo's niece, said the two women solved a problem for Dam when they moved in: Under Buddhist tradition, he shouldn't share living quarters with a nun. Holley said she's certain her aunt didn't know about the marriage between Dam and Le. 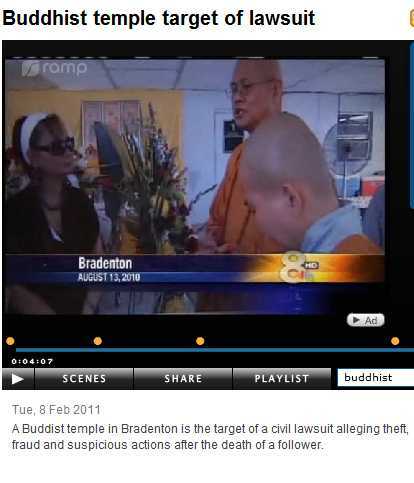 Holley said Le arrived a few years ago from Vietnam, where she worked with orphans before beginning a new role in Bradenton as the temple's resident nun. 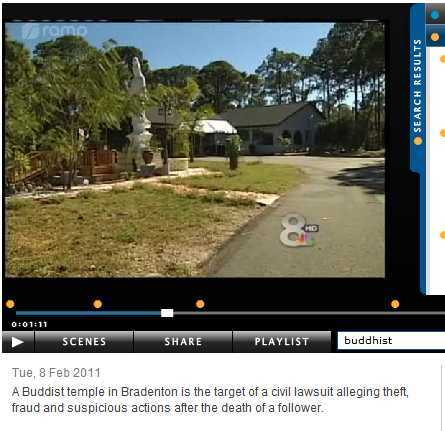 The temple compound on the outskirts of Bradenton, established in early 2009, includes a four bedroom house that serves as living quarters and indoor sanctuary. There's a manicured Buddhist prayer garden on the grounds and a statue of the Buddha. Vo's family paid Dam and Le to perform a traditional Buddhist funeral for Vo, who was 60 at the time of her death in August. They didn't know at the time about the marriage or the withdrawals from Vo's account. Photos and a video shot at the funeral show the nun weeping as she comforted Vo's grieving relatives. Suzuki, the temple's attorney, said in his written statement to News Channel 8 that Vo would be disappointed at the legal action taken by her family. "She would be saddened," he said, "to know that her estate's personal representative ... would come after those she sought spiritual guidance from in a time of need." Holley sees the temple leaders differently. "Their behavior just kind of leads to suspicion," she said. "Who would consciously do something like that while somebody is dying unless they're out for no good?" 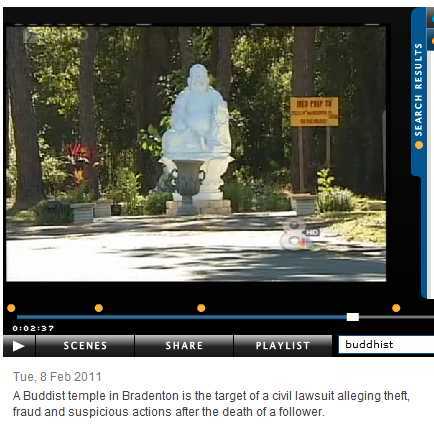 See Mark Douglas' investigation of the Buddhist temple tonight at 11 on News Channel 8. Posted by KTSkarlet on Feb. 7, 2011 - 3:39 p.m. It's all suspicious. 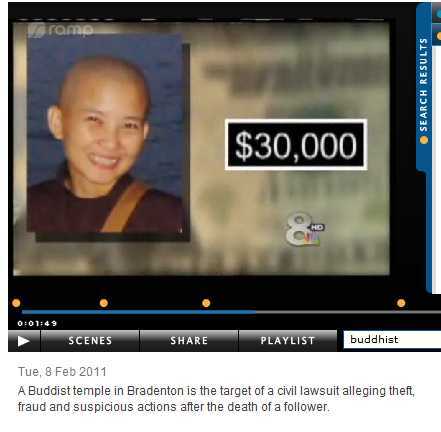 The deceit from the monks, nuns or whatever, the woman wasn't happy there, large amount of monies is transferred to the temple and/or its agents, but she hasn't transferred other personal property. But the big thing is, she's only 60 y/o and dies 3 months after moving in???? Come on bring in Quincy or CSI. Kim Sang Thi Vo's death has led to a family lawsuit against the temple where she lived. BRADENTON -- Kim Sang Thi Vo kept her financial matters secret in the decades she called Florida home, from the time she fled Vietnam with nine family members during the fall of Saigon in 1975. She had served as a translator for the U.S. military, she told a newspaper this past April, and was forced to run from the communist regime. 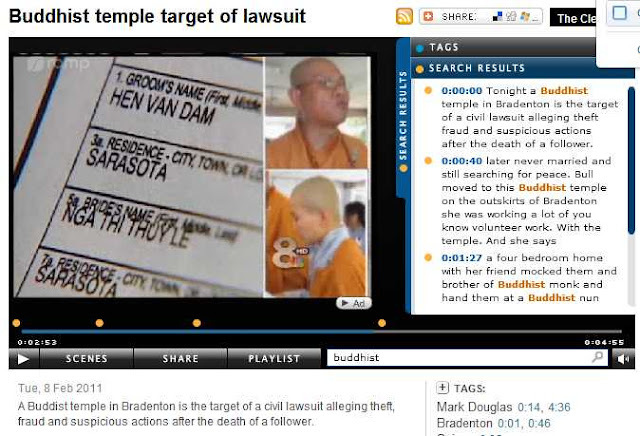 Now, in the months since her death in August, after she suddenly fell ill at the Dieu Phap Tu Buddhist temple in Manatee County where she lived, Vo's finances have become a matter of public record. Her relatives say in a lawsuit that as they visited the 60-year-old at her hospital deathbed Aug. 9, a nun from the temple was removing $30,000 from Vo's account. "We haven't even gotten word that she's legally dead and she's at a bank withdrawing money," said Mai Holley, a Vo niece who lives in Tampa. The suit also contends temple leaders declined Vo's request to call 911 after she complained of headaches. They gave her Tylenol instead, the suit says, and she died from a hemorrhage at a hospital the next day. Manatee County sheriff's detectives looked into the allegations in the lawsuit and have closed their investigation without filing charges. Still, Detective Larry Tyre said he remains puzzled by two other withdrawals Vo made from her account. They were for $4,000 each, made within 30 minutes of each other at separate bank branches, three days before her death. * * * * * An attorney for the temple rejects the fraud and conspiracy allegations in the lawsuit as nothing more than "a good piece of fiction." 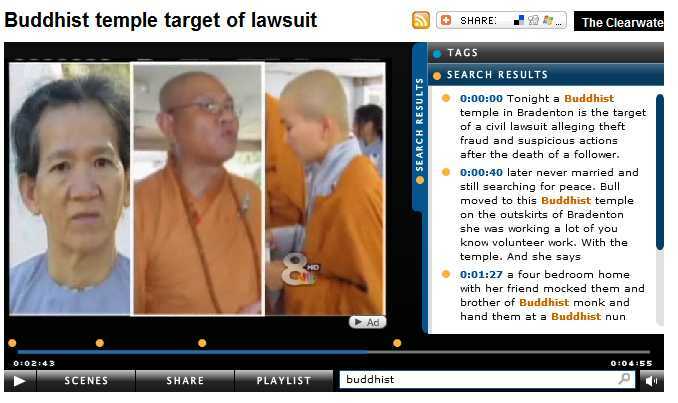 A News Channel 8 investigation, however, uncovered a temple secret that the family contends supports its allegations of fraud: The resident monk and nun - Hen Van Dam, 59, and Nga Thi Thuy Le, 36 - are man and wife. However, it's a practice not likely to sit well with the followers at Dam's temple. "It would create a big problem if that's the case and it comes out," said Kim Tran, one of the few dozen temple followers. 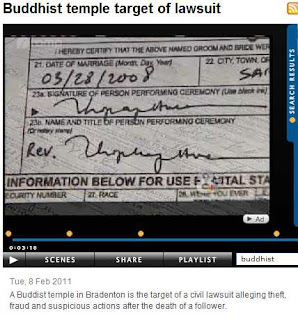 * * * * * The lawsuit filed against the temple by Vo's sister, Hong Rosson, says Hen Van Dam, his sister, Mot Thi Dam, and Nga Thi Thuy Le defrauded Vo out of her savings through trickery and deceit. •From the time Vo moved into the temple on May 17 until her sudden illness three months later, she was under constant pressure to donate her money to the temple. •At the insistence of Le, Vo demanded repayment of a 12-year-old loan from the ex-husband of her sister, Rosson. Ten days before Vo's death, Jeffrey Kent Rosson transferred $40,000 into the joint account Vo held with Le. * * * * * Vo's path to the Buddhist compound began in the final hours of the Vietnam War. Last year, on the 35th anniversary of Saigon's fall, a month before she moved to the temple, Vo described the ordeal to Florida Today in Brevard County. 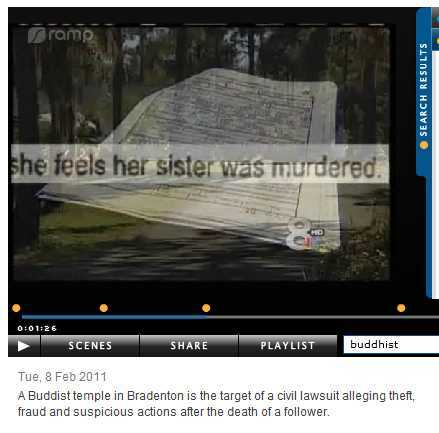 She lived in Brevard County for 17 years with her married sister, Rosson, and Mot Thi Dam. The temple compound on the outskirts of Bradenton, established in early 2009, includes a four-bedroom house that serves as living quarters and indoor sanctuary. There's a manicured Buddhist prayer garden on the grounds and a statue of the Buddha. 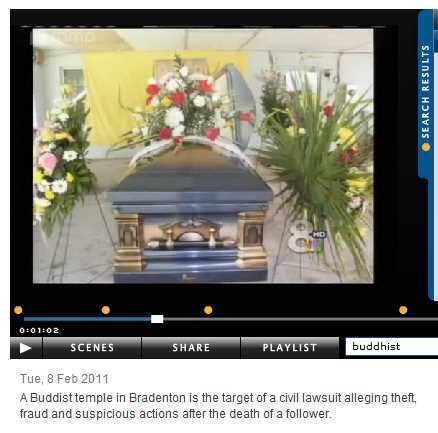 Vo's family paid Dam and Le to perform a traditional Buddhist funeral for Vo. They didn't know at the time about the marriage or the withdrawals from Vo's account. "She would be saddened to know that her estate's personal representative ... would come after those she sought spiritual guidance from in a time of need." 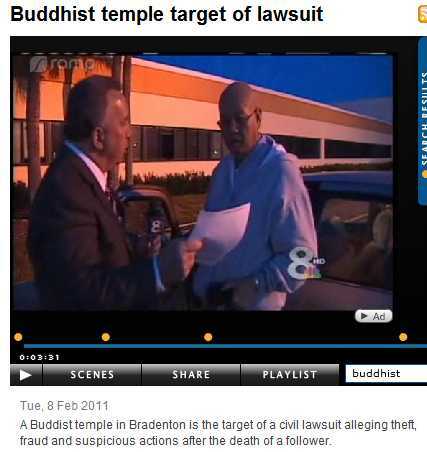 BRADENTON, FL (USA) -- Wearing the brown robe of a Buddhist monk, the gentle man with a shaved head stood out when he ventured out into the community. << Local Vietnamese Buddhists are able to practice their faith together in a new congregation located in Bradenton. 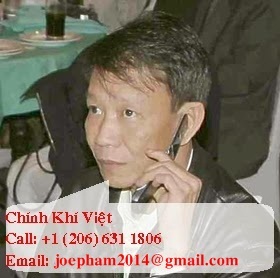 When other Vietnamese-Americans saw him, they would always ask about the possibility of opening a temple. “Not yet,” was the Rev. Thich Phap Hue’s reply. The tiny minority community lacked the resources and wherewithal for such an ambitious undertaking. 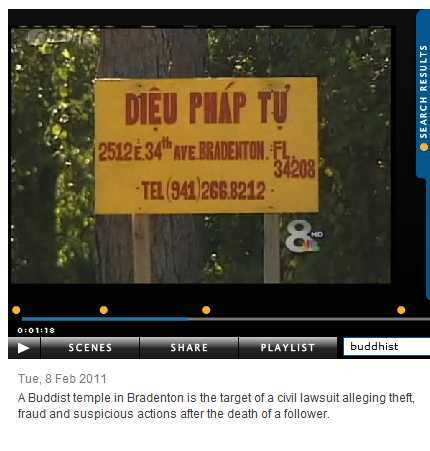 Thich Nu Dieu Thanh is a nun who serves the Dieu Phap Tu Buddhist congregation in Bradenton. It was his constant prayer that maybe someday, someway, local Vietnamese Buddhists could find a way to gather under one roof to worship in their native language. Last year those prayers were answered. Through the efforts of several Vietnamese-Americans, they found and bought a rundown house in foreclosure, sitting on three acres south of Bradenton. One chopstick you can break easily,” Hue says of the power of teamwork. “Not so with many chopsticks together.” Hue, and many of his congregation, survived the Vietnam War, fled the country after the communists toppled Saigon in 1975, and eventually made their way to the United States. Among them, Sarasota residents Nga Phong and her husband Thoi Duong. Thoi Duong, who had served in the South Vietnamese navy, was imprisoned for two years after the war. After he was released in 1977, he tried 23 times to escape Vietnam. Finally, in 1983, the couple and two daughters fled Vietnam on a boat with 55 other people, including 22 children. Thoi Duong steered the boat southwest across the Gulf of Thailand, not quite sure where they would make landfall. “Seven days and seven nights at sea with no food, no water. I thought we would die,” Phong said. The voyage ended on the southern tip of Thailand, near the border with Malaysia, where Phong revealed that she was pregnant with her third child. After 18 months in a Thai refugee camp, the family was moved to Indonesia for six months to learn English. Two years after fleeing Vietnam, they were allowed to immigrate to Sarasota, sponsored by Thoi Duong’s brother. Her youngest daughter, who was born in Thailand, will graduate as a medical doctor May 15. Her other daughters are a pharmacist and business owner. Buddhism, which has been called the religion of reason and meditation, is practiced by as many as 500 million people around the world. Egocentrism, possessiveness and greed can, however, be understood, overcome and rooted out through an eight-fold path of behavior in thought, deed and word that the Buddha taught, according to Ross. 5. No use of intoxicants. Hue says he encourages his congregation members to meditate and clear their minds of daily clutter and to live a life of love and compassion. On a recent Sunday, Hue led the congregation through a series of chants designed to do just that. “When you strive to think of nothing, it helps you remember everything,” Hue said. The group of about 25 men and women followed the monk as he lead them through a series of chants, palms placed together prayerfully. As they chanted, the worshippers continually move from sitting to kneeling to standing and then deeply bowing on the floor, before starting over again. 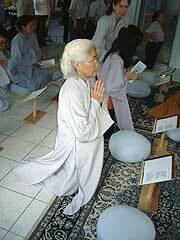 A nun, Thich Nu Dieu Thanh, provided a tap-tap rhythm on a kind of resonant drum. After the service, members shared a vegetarian meal and socialized, most of the conversation in their native Vietnamese. One of the congregation members, Hoa Pham, who works as a lab technician at a local hospital, said her faith helps her find peace, to forget herself and to help others. 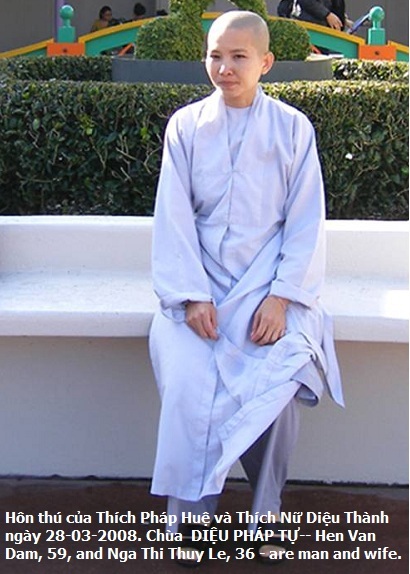 Among those who found peace in the congregation is 15-year-old Minh Bao, a Sarasota High School student who said he once had an anger problem. “I listen to the teachings of Buddha and I start to understand and calm myself down,” the polite, soft-spoken teen said. “My parents don’t care if I am a Buddhist or a Christian. They just want me to be a good person,” Bao said. Even though there is a sense of peace and happiness among congregation members, they have not been spared the tough economy. Phong was laid off from her job as a machine worker in October and has been unable to find another job. The Rev. Hue says that he counsels his congregation not to allow worry to consume them. “A lot of people are in the same situation. I tell them not to worry, but to come out and pray to find peace,” he said.